This was a result to suggest normal service is being resumed in the clutter below the title race. Arsenal may be patched up and makeshift, a team depleted by injuries to key personnel, but they are inching inexorably back towards familiar territory. West Ham had been a refreshing and worthy presence in the top five but they have been usurped. Only goal difference is keeping Arsène Wenger�s team out of the Champions League places. He had reason to be encouraged. It had been a test of mettle, particularly given Arsenal had played for 37 minutes with 10 men in beating Queens Park Rangers on Boxing Day and, given their crammed treatment room, have precious few options to make sweeping changes to their lineup. At times in the opening 40 minutes when Alex Song and Cheikhou Kouyaté strode purposefully around the Hammers� midfield and dominated the occasion, with Aaron Cresswell and Morgan Amalfitano lively on the flanks, the visitors had been horribly stretched but they also proved resilient. 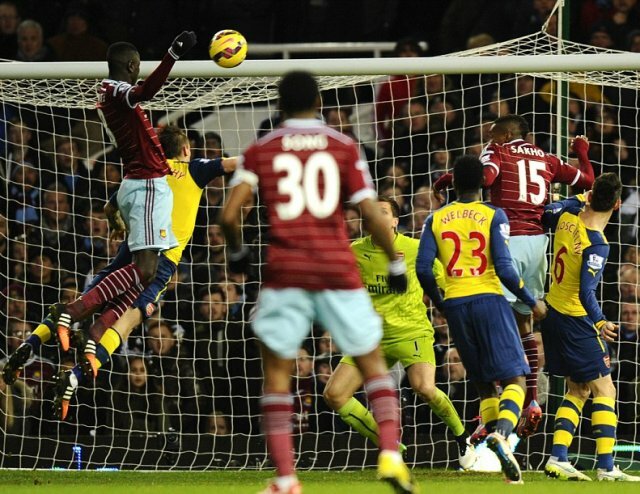 Song�s 20-yard volley was ruled out because Diafra Sakho and Kouyaté were deemed to be distracting Wojciech Szczesny from offside positions, and James Tomkins volleyed wastefully over the bar. Yet out of West Ham pressure Arsenal conjured a two-goal lead in a frantic passage of play before the interval and effectively settled the contest. Santi Cazorla�s dart into the penalty area provoked panic, Winston Reid losing his footing but lifting a leg to trip the Spaniard and concede a penalty. Cazorla converted that with glee and with West Ham players still incensed at the award and distracted in their frustration, Arsenal struck again. Alex Oxlade-Chamberlain burst to the byline and fizzed a centre through Reid�s legs and into the six-yard box where Tomkins was dawdling. Danny Welbeck slid in to score at the defender�s back. If West Ham were perplexed to find themselves behind then Kouyaté�s headed goal, having leapt above Mathieu Debuchy to meet Tomkins� centre, suggested another shift in momentum. Yet their huff and puff would yield nothing but disappointment and Enner Valencia nodded on to the roof of the net deep into stoppage time. Sam Allardyce�s complaints centred on Song�s volley six minutes in. �[Sakho] wasn�t in the eye line of the keeper and he didn�t touch the ball,� said the manager. �The ball went through his legs and he�s standing three yards to the right of Szczesny. [The referee] Neil Swarbrick cannot have a clear view whether Sakho is in the goalkeeper�s eye line or not. In truth, only the excellence of Adrián in the home goal prevented Arsenal restoring their two-goal lead late on, with the Spaniard delivering a flurry of fine saves. Allardyce will be confident his team�s upward trajectory can be restored when West Bromwich Albion visit on New Year�s Day but they are playing catch-up to Arsenal now. �To be in the top four is vital for us, and it�s all still to do,� said Wenger. �But we have done it 17 years [in a row], so I�m entitled at least to believe we can do it again.� His team are quietly rising through the ranks. Another statement must be delivered at St Mary�s. West Ham United (4-1-2-1-2): Adrián; O�Brien (Demel, 78), Tomkins, Reid, Cresswell; Song; Amalfitano, Kouyaté (Nolan, 78); Downing; Sakho (Valencia, 62), Carroll. Subs not used: Jaaskelainen, Noble, Collins, Cole. Booked: Carroll. Arsenal (4-2-3-1): Szczesny; Debuchy, Koscielny, Mertesacker, Monreal; Flamini, Coquelin; Oxlade-Chamberlain (Chambers, 90), Sánchez, Cazorla; Welbeck (Gibbs, 85). Subs not used: Ospina, Podolski, Walcott, Campbell, Akpom. Booked: Sánchez, Cazorla. Referee: N Swarbrick. Att: 34,977.